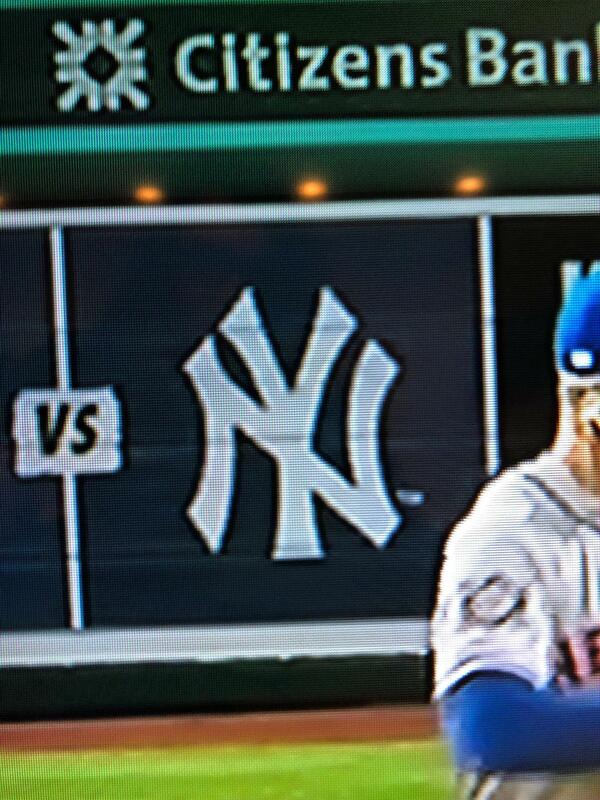 While watching the (frustrating) Phillies/Mets game, I spotted a odd Yankees logo in the background. I'm not sure if it's an official logo, because it looks very different from the other NY logos the Yankees use (that I've seen, at least). I'm not sure what it is but I can't say it looks bad. After a little bit of searching, I found that the logo is on the internet, but not on the main site as an official logo. Bleacher Report even uses it. I'm just wondering if anyone knows what the deal is with this NY logo? I think it's a 2d version of their hat logo, which i don't think is ever really used outside of their hat. Definitely looks strange not being embroidered. A couple years ago, they finally added the cap logo to their official digital files, and it’s been showing up more and more on graphics and (non-cap) merchandise. I would love to believe they’re finally phasing out that terrible, crooked print logo. The cap logo is so much better. The print is horrible. Standardizing to one of the other two would work for this non-Yankee historian / fan. Just switch back to using this and our problems are gone. Eh, I think this one is better. The bat really bothers me on the modern one, how it just stops. But I recognize that cap logos work better than the complicated primary logos for a lot of applications, and I’m just glad that they seem to be phasing out the print logo. If the Yanks ever wanted to standardize their cap and jersey logos, I’d suggest they use this one from their early days. I think the balance is much more appealing than either the skinny cap logo or the fat, wobbly jersey logo. That needs minor tweaking (to fix problems I’m not sure were in the original), but it’s much better balanced, more even, and could work on both the jersey or the cap. One of many problems with the mothership, I’m afraid. Chris, we’re willing to help if we can. The ESPN logo doesn't match the Bleacher Report logo. There are slight differences—most noticeably the top left of the N.
Good catch. The one on the right is the actual New Era cap logo, the one on the right is from Wikipedia and a bit incorrect. It is sadly not uncommon for companies to grab graphics online; that seems to be what has happened at Bleacher Report. The jersey logo is the worst of the three. Not only unbalanced, but the top spacing of the Y should not be that wide. The ESPN logo is better than the bleacher report one, that one doesn’t have enough heft to unify the NY logos. I’ve always been partial to the old helmet logo, too bad they discontinued it. This is a great example of how rendering could make or break a logo. The logo on the left - which is the accurate cap logo, FWIW - is perfectly balanced and has even and consistent line weights throughout. The logo on the right is far more unbalanced and does not have consistent line weights (look at the right diagonal bar of the "Y," especially where it meets the left bar, and also look at the stem of the "Y" relative to the crossbar of the "N"). The logo on the left can replace the current print logo, and probably should. The logo on the right never could - it looks like an amateur rendering (because it probably is an amateur rendering of the cap logo). I don't have the hatred for the print logo that a lot of people do, but I think unifying the Yankees' print identity around the logo on the left would probably be an upgrade. And it can become the primary, rather than the top hat logo that, while a classic, sticks out like a sore thumb relative to the rest of the Yankees' identity. Does anyone have a higher resolution version of that left logo? Or be able to replicate it in high res? Because I think that might be the long awaited "perfect" rendering of the Yankees' cap logo. The print logo is directly derived from this, though the stem of the Y is much shorter on the print logo than here. 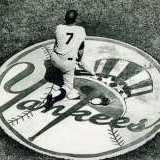 Not that that should influence what the Yankees do in terms of the interlocking NY, but just found that picture to be of historical interest. Yes, that was the inspiration for the original Yankees logo. But they never used that specific version. And considering how many variations they went through before the print version was introduced, I’d wager that any specific resemblance to the original medal is more coincidence than anything. I hope the Yankees never standardize. The Tigers did, and I think they really harmed home jersey.